Some commentators may have refused to take Strauss at his word, but the uncredited director of this BBC transmission of a 1974 Proms concert is clearly not among them. His view of things is crystal clear for, throughout the whole of the work’s first section, a musical depiction of Der Held (The Hero), he resolutely directs his cameras at the conductor. There is, in fact, not a single second of that opening 4:59 of music when Rudolf Kempe is not pictured on-screen, whether in close-up, middle distance or in long-shot. The corollary of that fact is that as soon as we begin the work’s second section, Des Helden Widersacher (The Hero’s Adversaries), we start to see the orchestra members on their own – but maybe I am now stretching my theory of the supposed relationship between the visual images and the “text” just a little too far. 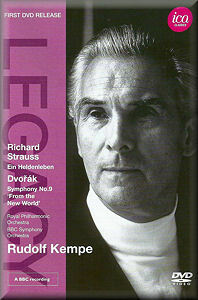 Even though Kempe’s widow Cordula records in the DVD booklet notes that her husband “thoroughly resented” being pigeonholed as a Strauss (and Wagner) specialist, his affinity with Strauss’s music was well recognised at the time. His record company EMI persuaded him to set down the complete orchestral works on disc. No less a personage than the Queen Mother reportedly gushed “Oh, Mr Kempe, when will you do the Alpine Symphony again?” (rather a surprise, given recent revelations of the sort of music she listened to at home). And, as evidenced in this performance taken from the conductor’s very last concert with the Royal Philharmonic Orchestra, the 1974 Promenaders were quite over the moon with this Ein Heldenleben; critic Joan Chissell reported that this performance elicited “a hero’s ovation and rightly”. Having never seen Kempe conduct live or on film before, the first thing that struck me was just how physically charismatic and animated he was on the podium. By fastidious, very precise gestures with both his baton and the fingers of his left hand, he coaxes some exquisite sonorities that we can fully appreciate thanks to his scrupulous care for orchestral balance - and to the installation of fibre-glass acoustic diffusing discs on the Royal Albert Hall’s ceiling just five years earlier, successfully reducing its notorious echo. The outstanding characteristic of Kempe’s interpretation is that, by the application of both sensitivity and sensibility, he gives Strauss’s score the opportunity to breathe. This is, indeed, anything but a brash, bombastic account: the orchestra plays with notable and carefully controlled intensity and Erich Gruenberg’s substantial violin solos are especially affecting - he justifiably gets a special roar of approval from the Promenaders as he takes his bow. If the Strauss is very fine indeed, the Dvorák is, however, outstanding. Edward Greenfield’s booklet notes suggest that its distinguishing feature is the wide range of dynamics that Kempe applies. What struck me most, however, was the interpretation itself. In contrast to performances that emphasise the score’s elements of cheery Bohemian bonhomie, Kempe’s is a deeply serious account. The opening movement is characterised by fierce attack and precision - wonderful playing from the BBC orchestra - and Kempe minimises the elements of lyricism in favour high drama. In a similar vein, the second movement’s sentimentality is entirely played down. Its well-known “big tune” (Goin’ home, Goin’ home, I’m a goin’ home / Quiet like, still some day, I’m just goin’ home) is moved purposefully along and the fervent manner in which its central section is played communicates, to this listener at least, a distinctly uneasy feeling of agitation and unrest. Kempe’s interpretation is nothing if not consistently of a piece for the scherzo and the allegro con fuoco finale are similarly driven powerfully forward. The formers elements of bucolic rusticism are given short shrift and the latter, right from its opening bars, emerges as a real daredevil ride and is terribly exciting - while still very skilfully controlled and crafted. This New World is one that emerges as a real eye-opener and a very different work from the one that we’re usually presented with. It justifiably receives a huge ovation from the audience. This new DVD, then, preserves some superb performances. The direction – originally for BBC TV - is expert and thus almost entirely unobtrusive, the visual image - in colour throughout - is sharp and pleasing and the sound is more than acceptable. It offers an opportunity to acquaint or reacquaint oneself with a conductor of the highest calibre, performing live and at the peak of his abilities.